This article was originally published by the Pacific Forum on 14 January 2019. Pyongyang has long held that their nuclear weapons are a necessary deterrent and has made similar statements in the past, but not so clearly, nor with such a detailed explanation, nor at such a crucial time. Why did they choose to do so at the very end of 2018? There is a degree of unsatisfactory speculation that must take place to try to answer such a question, but we can see a few key elements of the negotiating procedure. The North Koreans have made it clear they want to deal with President Trump himself, probably correctly assessing that he is more likely to make concessions or take significant risks than are his subordinates. Moreover, working-level negotiations have moved slowly over the past several months. The DPRK statement, released in a semi-public way on the newswire, might have been an attempt to get the issue clearly and squarely on the president’s desk. 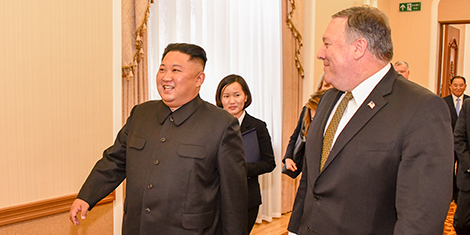 Perhaps the North Koreans don’t believe Secretary of State Mike Pompeo is relaying messages to Trump. Or perhaps the recent retirement of the CIA’s Andrew Kim, who has liaised with the North Koreans alongside and for Pompeo, worried Pyongyang. Stephen Biegun, the new US special representative for North Korea, is an unknown quantity to them. Pyongyang probably didn’t want to resume and rehash this year’s logjam with Biegun in the new year. This leaves President Trump in a bit of a bind. He has to decide if he wants to proceed with the peace and denuclearization process as North Korea has defined it. He could choose a couple different paths. First, Trump appears to have very few deeply held beliefs about the international order, other than that the US has generally been taken advantage of on trade and multilateral defense. He certainly doesn’t care much for alliances. One could imagine him saying, “that’s fine, we could remove our nuclear umbrella from South Korea” once we move toward denuclearization of the north. This would face tremendous pushback from the policy and military communities in the US as well as from allies in Asia, however. It would be the sort of pronouncement that would leave him isolated from much of his administration, Congress, and the pundit community that comments on TV; it would be hard to sustain this position. More likely, he could say, “fine, let’s talk about a freeze on your program and worry about denuclearization later.” This seems more plausible for several reasons. First, his core constituency doesn’t really care about denuclearization. His base wants to see Trump keep winning and if he tells them this is a win, they will likely accept it and move on. He has shown he is rhetorically able to slip out of nooses that other presidents would have choked on. He could conceivably pivot toward a freeze and cap of the North Korean nuclear program as an attainable goal and let the experts – who again largely don’t matter to his base – fight about whether this is good enough. In that regard, Trump may well have been aided by a shift in the professional North Korea-watching community. Since roughly the fall of 2017, when war rhetoric and tensions were escalating, an increasing number of commentaries, events, and lectures with titles along the lines of “living with a nuclear North Korea” began to appear. There are now clearly more voices in the analyst community willing to say that the United States can tolerate and deter a nuclear North Korea. Such an opinion was incredibly scarce in 2016. This is a situation that Trump helped foster. His administration helped raise the prospect of conflict that really did highlight the absurdity of war on the Korean Peninsula. The administration was essentially saying “we are willing to risk a nuclear war to prevent a country from being able to wage nuclear war.” This focused a lot of minds and helped clarify the fact that deterrence remains viable. Whether that means seeking to cooperate or continuing to pressure and isolate North Korea remains up for debate. President Trump could conceivably articulate a position in which a freeze of the North Korean program is a realistic goal that takes place alongside improved relations between the two countries, putting the issues of the DPRK’s stockpile and the US nuclear umbrella in Asia off for a later date. This formula would be unsatisfactory to many people, but Trump has shown a willingness to upset traditional stakeholders. Besides, this is North Korea policy. Past attempts at pressure and engagement have been unsatisfactory to one group or another. The status quo is basically unsatisfactory to many, particularly in South Korea. Satisfying everyone will be impossible. Who Trump decides to upset will define how the next round of negotiations with the DPRK goes. Andray Abrahamian is the 2018-19 Koret Fellow at APARC, Stanford University. He is an adjunct fellow at Pacific Forum and Griffith Asia Institute, an honorary fellow at Macquarie University, and a member of the US National Committee on North Korea.